Oh, look, it’s Bryan Cranston in a film about drug cartels and assuming another identity to get ahead in that business, so the logical step is to compare it to Breaking Bad, right? 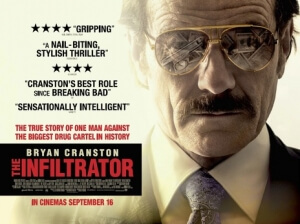 That’s how other reviewers are probably writing about The Infiltrator, but personally I like to think that this is actually a spin-off of Cranston’s character from Argo, about how after he left the CIA when that operation was done and dusted, and then became an undercover agent and busted the several crime rings of Pablo Escobar. Or, at least, that’s my personal head-canon. Either way, it’s got Bryan Cranston in it, and luckily the film is as awesome and entertaining as he is. Cranston is actually portraying Robert Mazur, a real-life US Customs Service agent who in the mid-80s went undercover as “Bob Musella”, a corrupt businessman who would embed himself deep within notorious drug lord Pablo Escobar’s money laundering circuit. From there, he would uncover several major players in the scheme, including high-ranking operative Roberto Alcaino (Benjamin Bratt) and the crooked Bank of Credit and Commerce International, which was responsible for soliciting deposits from drug lords and several international criminals. As you can see, it’s very easy for people to make connections to Breaking Bad, especially seeing how someone like Cranston is involved, but this takes a different turn that sets it up more as a spiritual successor to something like American Hustle or The French Connection. There’s even a little Scorsese influence here and there, especially in long tracking shots that take place nearer the movie, which look and feel like something the legendary director could craft in his sleep by this point. It’s a triumph for director Brad Furman, who here rebounds successfully from the dire Runner Runner and brings things back to the grounded grittiness of his other earlier film The Lincoln Lawyer, which funnily enough also featured Cranston and co-star John Leguizamo in small roles. Furman drives home the tension where it counts, giving scenes an uneasy and uncertain vibe as it constantly throws you a curveball; sometimes, you’re not even sure if Mazur is going to make it out alive, even though it’s pretty obvious he did in real life, otherwise there wouldn’t be a story to tell. A lot of this story has been done in other films before, and sometimes a little better than this, but that doesn’t mean it’s not extremely engaging to watch, and once again it all comes down to the execution which Furman manages to achieve fairly well. And, let’s be honest, a lot of this movie works because of its lead actor. Bryan Cranston is one of my favourite actors, so I may be slightly biased in saying that he delivers an awesome performance here, but it’s true: the guy does such great work switching from persona to persona, as the devoted family man one moment and the cocky businessman in a suit the next, all with the intent of making the world a little bit safer. There’s a great scene where both of these come together to help Cranston absolutely deliver, and I won’t ruin it for you here (mainly because it needs to be seen with fresh eyes) but it combines the building tension of the “How am I funny?” scene from Goodfellas with every waiter’s worst nightmare. You’ll know it when you see it, but take my word for it that it’s just so great to watch, as is Cranston throughout this entire movie. He’s also got a good supporting cast to back him up in scenes where he might need a little help (not that this ever happens, but you never know…). John Leguizamo does great work with basically being John Leguizamo here, and Diane Kruger stands out as a fellow undercover agent who is brought in as Musella’s fake fiancé after he accidentally reveals he has one whilst on duty. Also look out for Jason Issacs in a small role as a counsellor, which is sure to please Mark Kermode very much. The cast, as well as some solid direction that keeps the momentum going all throughout, make The Infiltrator a hugely fun slice of crime thriller gold which might not be an instant classic, but will leave you with a sense of pure enjoyment. The Infiltrator is an entertaining crime thriller that is boosted by strong direction and an awesome performance by the ever-reliable Bryan Cranston, who brings this wildly fascinating true story to the big screen with competence.